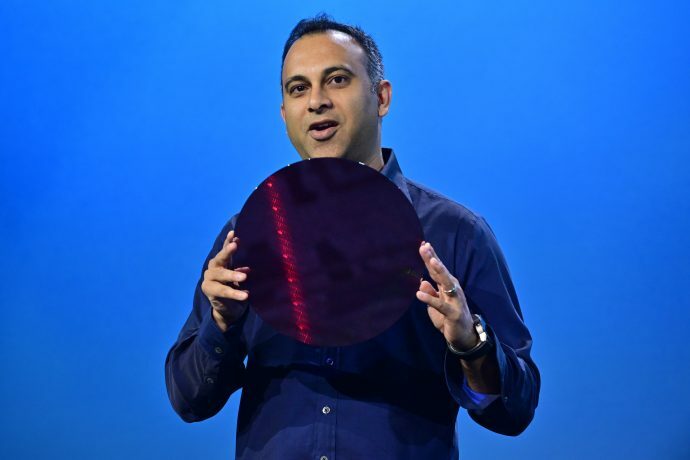 Navin Shenoy, Intel executive vice president and general manager of the Data Center Group, displays a wafer containing Intel Xeon processors during a keynote on April 2, 2019. In San Francisco on April 2, Intel Corporation introduces a portfolio of data-centric tools to help its customers extract more value from their data. Credit: Walden Kirsch/Intel Corporation.9 Apr 2019 San Francisco - Intel and Google Cloud have signed a strategic partnership aimed at helping enterprise customers seamlessly deploy applications across on-premise and Cloud environments. The two companies will collaborate on Anthos, a new reference design based on the 2nd-Generation Intel Xeon Scalable processor and an optimized Kubernetes software stack that will deliver increased workload portability to customers who want to take advantage of hybrid Cloud environments. Intel will publish the production design as an Intel Select Solution, as well as a developer platform. While organisations are embracing multi-Cloud solutions to fuel their businesses, many companies remain challenged to find the right hybrid Cloud solutions that enable seamless workload migration across Clouds. The new Anthos reference design will address this challenge by delivering a stack optimized for workload portability, enabling deployment of applications across on-premise data centres and public Cloud provider services. "Google and Intel enjoy a long-standing partnership focused on delivering infrastructure innovation to customers", stated Urs Hölzle, senior vice president of Technical Infrastructure at Google Cloud. "Data centre environments today are complex, and hardware and software infrastructure is not 'one size fits all'. Our ability to collaborate with Intel and take advantage of their technology and product innovation to deliver Anthos solutions ensures that our customers can run their applications in the way that best suits them." "Our collaboration with Google in delivering the infrastructure and software optimizations required to advance their hybrid and multi-cloud solution is a natural fit with Intel's vision for data-centric computing", stated Navin Shenoy, executive vice president and general manager of the Data Center Group at Intel Corporation. "We're delivering an Intel technology foundation for customers to take advantage of their data, and that requires delivery of architectures that can span across various operating environments. This collaboration will give customers a choice of optimized solutions that can be utilized both in the on-prem as well as Cloud environments."